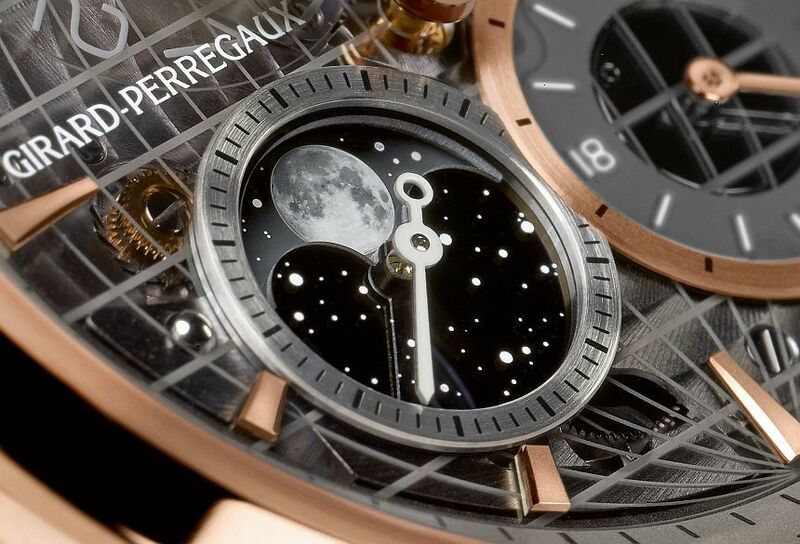 Let us just set one thing straight off the bat: with the Girard-Perregaux Traveller Large Date, Moon Phases & GMT, the brand has not introduced three different watches. Rather, they have given a rather cumbersome name to a rather lovely timepiece that incorporates some complications – any guesses as to what they are? 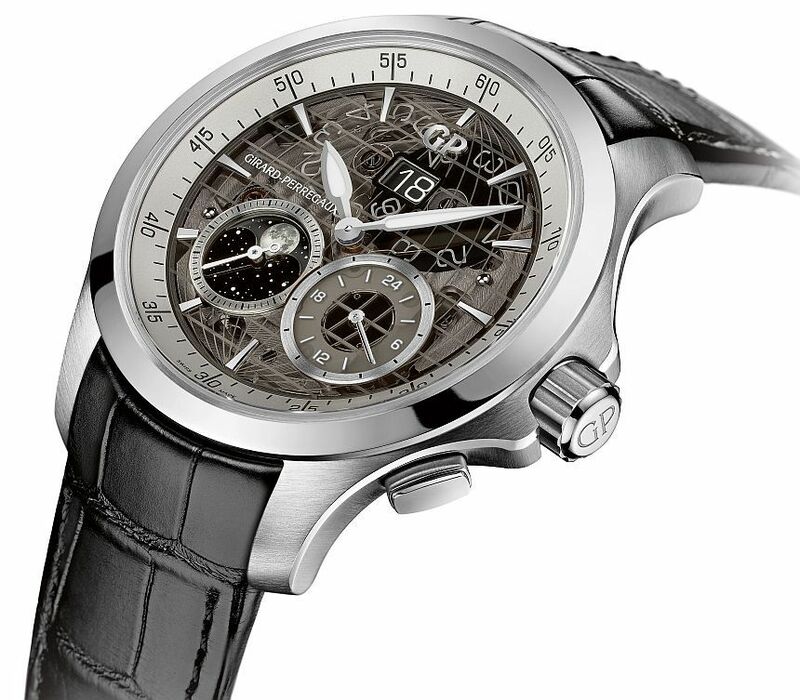 For sake of brevity, I may instead refer to the watch solely as the Girard-Perregaux Traveller. Obviously, there is a lot going on with the watch. Aside from the three complications (which we’ll get to shortly), they have also managed to give the watch the appearance of having an open dial. By that, I mean that they have made the dial of sapphire (which appears to be tinted a bit) which allows you to see some portions of the GP03300 automatic movement inside. Through experience with other watches equipped with see-through dials, I have become a fan of this sort of open dial, as it allows some mechanical bits to be shown off on the dial side without it being a distraction and compromising legibility. 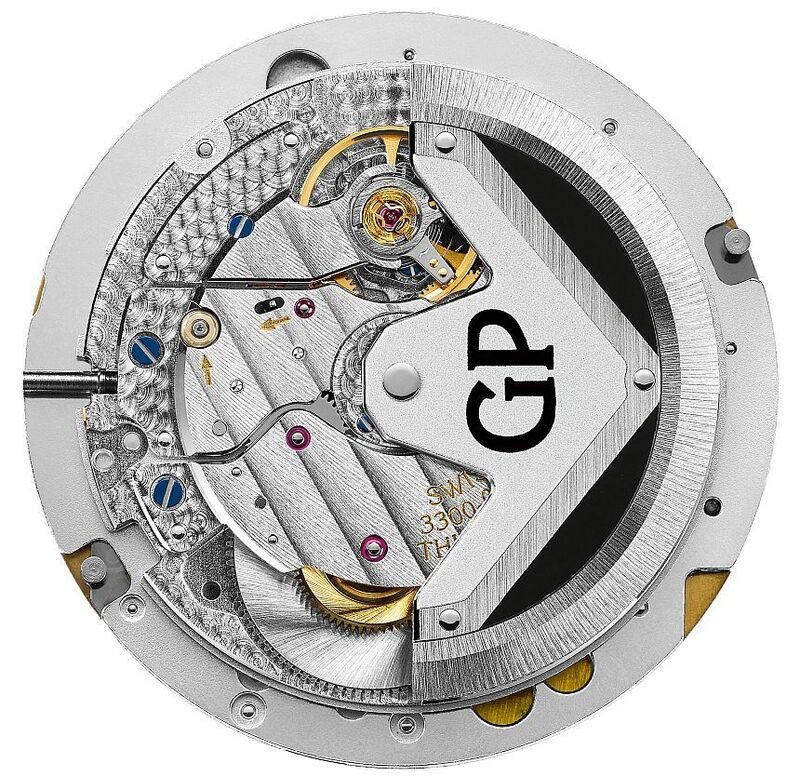 Here, though, on the Girard-Perregaux Traveller Large Date, Moon Phases & GMT, things get a bit busy around the date display, as you have two discs (with their numerals) visible under the dial. Or, to be more accurate, the numerals are visible, as the discs themselves really are not. Both of these discs are made of a transparent material that makes it look, in the date display window, to be a seamless, one-piece date. This is a clever bit of engineering, and I rather like it. Even on date displays that do not have an obvious divider between the digits, you can often see a gap or seam between the discs. Here, it is just one smooth display, and I am a fan. 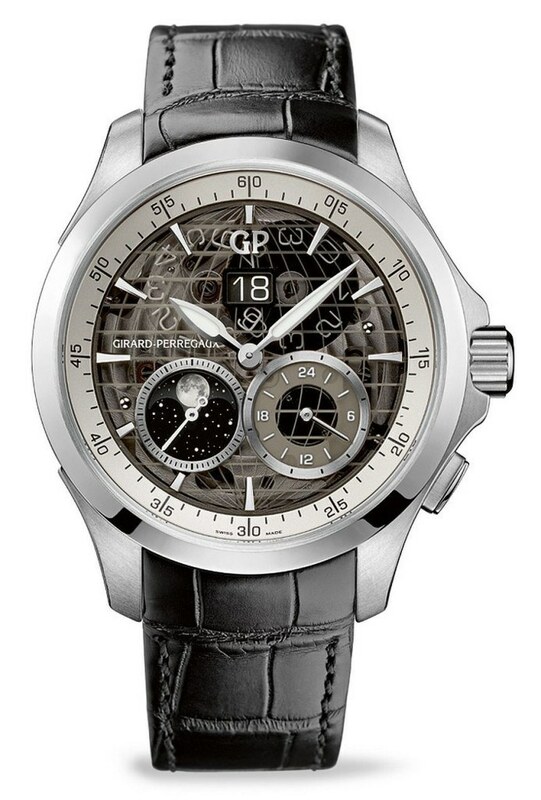 Next up in this Girard-Perregaux Traveller is the phase of the moon indication. As far as complications go, these certainly look pretty on a watch – and this one is quite well done in terms of realism – I just really do not find them to be all that practical, as I think most people would attest. 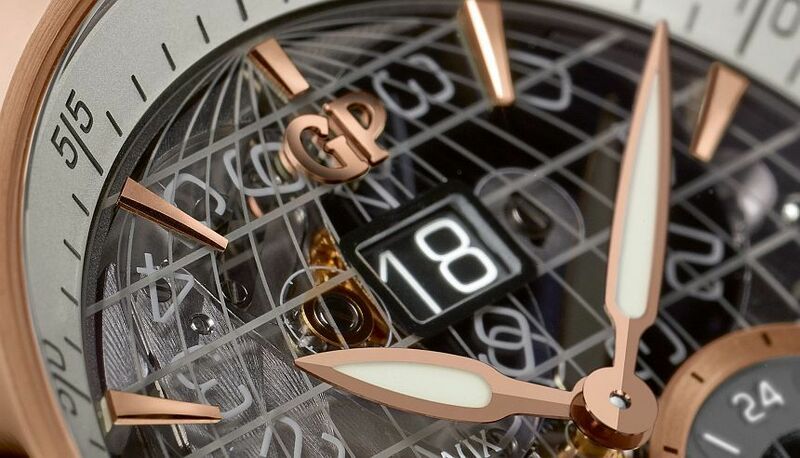 Aside from the bit of art it adds to the dial, it also serves as a balance to the GMT (or second time zone) indication right next to it – a display you should be able to set through the pusher set into the side of the case at the 4 o’clock position. Pair that to the world map that is imitated by the parallels and meridians inscribed into the dial, and you have a watch that really wants to travel with you. All of this is housed in a pretty modernly sized 44mm-wide case – arguably, easier to accommodate the large date displays, I suppose – which, whether it is in steel or pink gold, will have alternating brushed and satin finishes. For a watch of this size, it is relatively thin, at only a hair over 12mm, all the more impressive when you consider the three complications plus the automatic rotor had to be fit in. 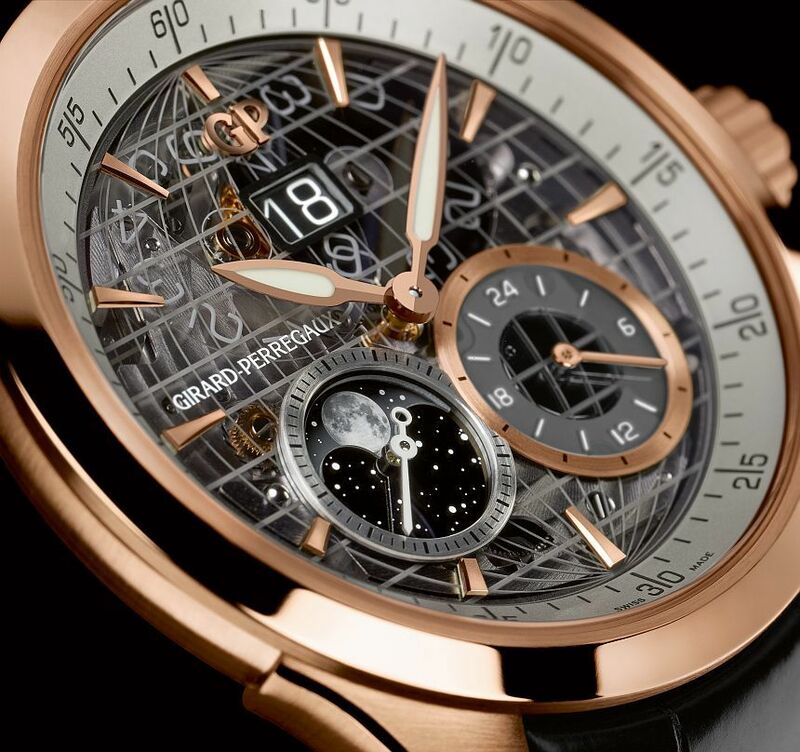 Oh, and should your travels involve some swimming, the Girard-Perregaux Traveller Large Date, Moon Phases & GMT carries a WR rating of 100m, so you should be good to go.